The opening chapter of Dr. No has a disturbing scene taking place at an exclusive establishment in Kingston Jamaica, not far from King’s House. On the eastern corner of the top intersection stands No 1 Richmond Road, a substantial two-storey house with broad white-painted verandas running round both floors. From the road a gravel path leads up to the pillared entrance through wide lawns marked out with tennis courts on which this evening, as on all evenings, the sprinklers are at work. This mansion is the social Mecca of Kingston. 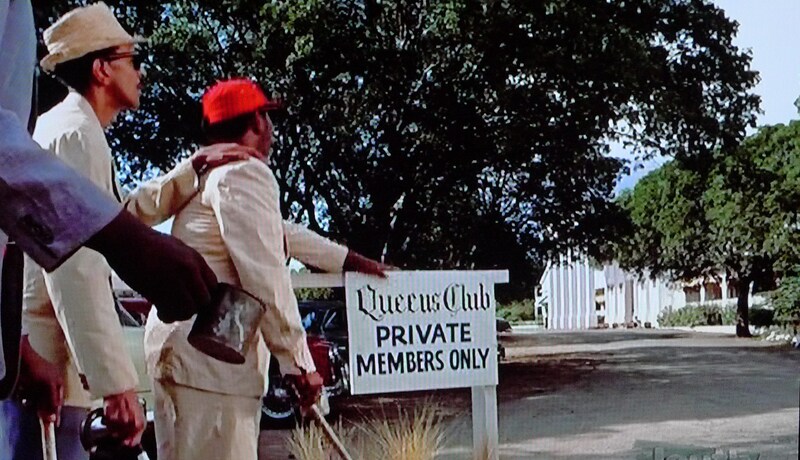 It is Queen’s Club, which, for fifty years, has boasted the power and frequency of its black-balls. Such stubborn retreats will not long survive in modern Jamaica. One day Queen’s Club will have its windows smashed and perhaps be burned to the ground, but for the time being it is a useful place to find in a sub-tropical island—well run, well staffed and with the finest cuisine and cellar in the Caribbean. Scene from a movie filmed four years after Fleming’s novel. Inside the club, four prominent men are playing their nightly game of high bridge. One of the men, Commander John Strangways leaves the club at 6:15, as is his routine, to run back to his office for a daily call, after which he normally returns to the club. This time however, he will will not return. Just before six-fifteen, the silence of Richmond Road was softly broken. Three blind beggars came round the corner of the intersection and moved slowly down the pavement towards the four cars. They were Chigroes—Chinese Negroes—bulky men, but bowed as they shuffled along, tapping at the kerb with their white sticks. They walked in file. The first man, who wore blue glasses and could presumably see better than the others, walked in front holding a tin cup against the crook of the stick in his left hand. The right hand of the second man rested on his shoulder and the right hand of the third on the shoulder of the second. From the same film as above. Strangways is shockingly killed, and the events are set in motion which eventually brings James Bond to the island of Jamaica. 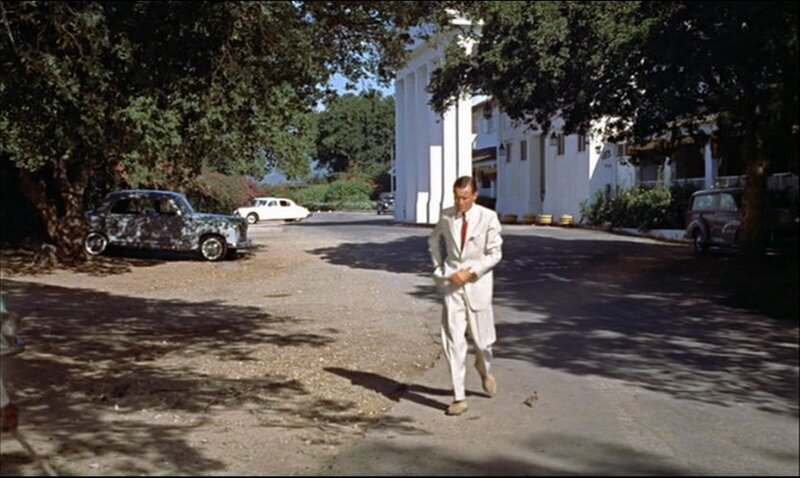 The Colonial Secretary, Pleydell-Smith later takes Bond to lunch at Queen’s Club, where he gives Bond some more background on the case and on the people of Jamaica. 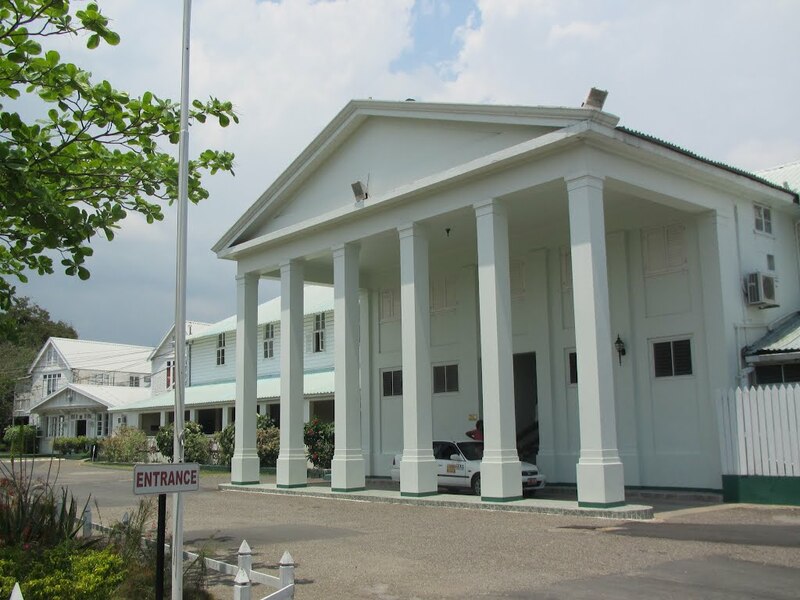 Fleming’s Queen’s Club is based on the real life Liguanea Club. which opened in 1910, and is still in business to this day. ‘And James, it’s not far from the Liguanea Club and you can go there and play bridge and golf when you get better. There’ll be plenty of people for you to talk to. Whether Fleming’s change was accidental or due to the change in government (Jamaica became Independent) he removed the Queen’s Club name, I’m not sure, but it is interesting.